In addition to still incomplete roads around the site that would carry materials to the launch pad, the images also show grass and other vegetation growing over the foundation of the new assembly building at the Tonghae site. The images were taken on May 26. Construction began on Tonghae in 2011 and the site is separate from the Sohae facility from where a long-range rocket successfully launched a satellite into orbit last December. Explanations for the stoppage range from the diversion of workers to other parts of the country to help with reconstruction following the heavy rains and typhoons in 2012, to a decision by the government of Kim Jong-un that it does not need a second facility to test long-range rockets. "We're sort of at the thin edge here where we see something's happening, but we need more time to figure it out," Wit said. 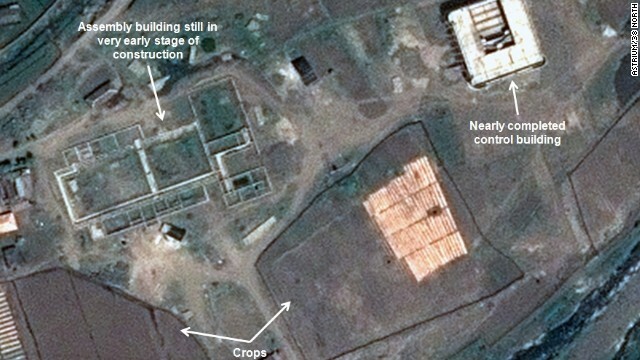 Satellite imagery released earlier this month showed North Korea moving ahead with efforts to improve and possibly modernize its missile program through a series of engine tests. Those tests appeared to have been done at the Sohae launch facility. Analysts who follow North Korea say the Tonghae site always appeared to be designed to handle larger rockets, perhaps even larger than the Unha rockets the North launched in their two previous tests last December and April. Earlier imagery of the site based on the launch pad, fuel tanks, and size of the missile assembly facility suggested a support site for rockets perhaps two to three times as large as those already tested. The Sohae site is also capable of launching rockets larger than the Unha. But the question of whether work will ever continue at the newer site will likely have to wait for another day. "If we go through the summer and nothing is happening, you probably could conclude that it does not look like they are going to restart, but it's a little premature for that," Wit said. I agree less aggressive no way. It's simple they have a shortage of trusted workers and money. Sites like this need to have secrets. Maybe North Korea realizes they don't need to make a show of bigger rockets when they already have the capacity to put a satellite into orbit and destroy the United States with one small nuclear device that produces EMP. I doubt their lack of activity on this site is a demonstration they are becoming less aggressive, less militaristic, or less of a threat to the United States. It could be the exact opposite. When is the end of the fiscal year in N.K.? It could be as simple as budgeted funds just aren't available yet. It may be that in order to do his sabre rattling the young fella had to pull the people working on this project to parade in the capital for the cameras. There is also the fact that the general who is the mind behind the throne maybe playing a little cat and mouse. Either way with images like this it doesn't seem like the next launch will be as big a surprise as the last one. Then there is this relationship with South Korea and getting their people back to work. I think North Korea will have its hands full for the next year or so. Iran on the other hand presents a more dangerous situation and one that will have to be dealt with in the very near future. The best policy for the US is to totally ignore North Korea! NK is China's problem child, not ours! If China cannot, and will not, control their errant child, all we have to do is ban all Chinese cargo ships from docking in the USA! The Chinese economy would totally collapse very quickly! So what if China owns much our our debt, just tell China "Sorry Charlie", get your ignorant step child straightened out or send your cargo ships elsewhere. Pay our debts? Forget it! Any broker will tell you that investment bears risk, including the loss of capital! This is how the system works. If China was stupid enough to buy our debt, they are subject to loss of capital. Go f++k your communist leaders until you get your beloved NK under control! Yea it would be nice if the world worked that way. US economy is tied with china. US can't just stop imports wih china and US can't just impose tarrifs. ...we learned from the he smoot-Hawley Tariff act of 1930. All the soldier workers are busy building a ski resort as of 6 months ago. I read it on Korean news. Don't expect progress on this site until March/April of 2014 when we US and SK perform their next scheduled drill. Your post I thought was strange and I looked into it and considering the leader of that country , It could be. Maybe N Korea lost their lease and are looking for a new site.Even the Boy Scouts know where these missile sites are,nothing new just the address has been changed!! If you take NK seriously about its desire to seriously attack us, then this should be a bit worrisome. It seems reasonable to conclude scaling up what they have done is relatively simple. It might be the final assembly to achieve their stated goal. Reasons why it was stalled , could vary significantly. Hiccups in scaling up the devices, Pressure from China, It also might have been a bluff. If it was me in his spot I would have canceled it due to its obvious nature after pressure from Iran. Diverted the workers elsewhere where the EITS can't see it. They are working with Iran and what ever this is will touch on Iran.